12 years 3 months working as a personal trainer over across different Gym. I gave classes like Pilates, BodyJam, Bodycombat Express, Bodyattack, Bodypump, sometimes Zumba Classes and Yoga Classes. I married to husband Gary Benstead early last year, gave birth to my first child (Emma) at 35 yr old just before Xmas 2015. It was a long 46 hours labour. I gained 10.5kg in total and my daughter was 3.12kg. I am a very active person and stay at home to recover from the nasty labour was not easy for me. I almost suffered a postpartum depression. One of my friend recommended MagicFit for postpartum recovery. I started it on Monday, the second week after I gave birth. It is a nice Sunday afternoon after a few days of rain. I ran through all my thoughts and done a brief review on MagicFit Waist Trainers. In general , I am very happy and impressed with the product and its professional waist training specialist service comes with it. I called and pretend to be a “dum” customer who has no idea about waist training. The Operator was warm, polite and right to the point. Her professional guidance from my opinion is well trained and very easy to follow. Then I moved onto the next stage, I pretend I do not know how to use computer, a phone order has done. It took approx 3 mins for the order once I decided what to buy after following all the instructions. 1. 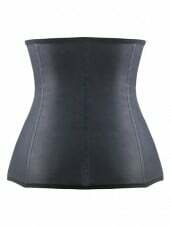 Latex Waist Trainer (There are 2 items in Latex, I used the Original Kim Kardashian Latex Waist Trainer in size M but when I start to use S and XS , I’ve chose the Raw Latex. Fabric & Structure: Very bright colour. Look exactly the same with the picture. Nice elastic Fabric outer lining. Latex in the middle. Cotton lining. Strong right-angle hooks for stability. Very nicely built. Wearability: You need to hook from the top to the bottom to be able to put it on easily. I started with a belly looks like I was still 5 months pregnant. So the “under bust” area was not as tight as around my waist simply because I was a round ball shape around my belly and the corset is in an hourglass shape. As I work my way down. It took me only 2 weeks and 3 days to go down to size S. I started the Raw Latex Waist Trainer. Effectiveness: A lot of review said it is extremely hot. I have to give it a fair review. well it is hot but not too hot. Actually when you put it on you immediately feel like your muscles are “toned”. Its this coolness and tightness. After you body-heat heat it up, it start to effect on your body. I can not feel I have sweat until I took it off. My singlet inside were always totally wet. As I mentioned above, I went down one size for only 2 weeks and 3 days. (note: I didn’t breastfeed, so it wasn’t breastfeeding which made my loss so much fat) I clearly know it was the corset. When you took it off, you could actually feel your core is tiered. Very similar to after you done 200 sit-ups in gym. Fabric & Structure: It feels a lot different from the Original Kim Kardashian Waist Trainer. It is actually heavier. When you touch the surface, you can feel the rubber feel. It feels thicker but when I measured it, it is almost the same thickness actually. Wearability: Hooks look stronger. Banner in the front is larger and more stay-able. Effectiveness: It feels cooler when put it on but it feels faster to warm it up. When take it off. I have more sweat than the original Kim Kardashian Waist Trainer. Well from S to XS took me 3 weeks and 4 days. But I was size S before I got pregnant, so XS is the smallest ever I got into. Fabric & Structure: Nice Fabric, feel like some very strong band (rubber band) but wide) and with bones build in it. These bonds are easily bend and able to come back to it shape. I goes along your own shape and try to push in around the waist area. It slim me 1.2 inches straight away when put it on (not even on the tightest hook). Fabric looks strong and bonds are well structured. 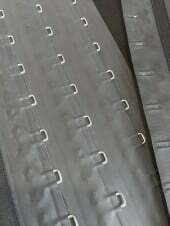 hooks look reasonably stayable considering they need to be small and seamless. Comfortable - 5 star. even with the bonds. Very well structured. Although it is not recommended to sleep in. I slept in it. It was absolutely fine. So you may save some money which you don’t need to buy shapewear bodysuits and use this instead. 3. Steel Boned Hourglass Creator Ultimate Waist Training Cincher Waist Trainer (Group B Waist Trainer with Lace Tie-back) - Short version. I am only 162cm and I have rather long legs and short waist. I use the short version Cincher which is the long name I quote above. It is available in both white and black and I chose the black simply because it is not easy to get dirty. White could easily look dirty even after wash. (unless you bleach) Because it has steel bones inside, I rather not bleach this. But they have white available might because some girls can wear it with wedding dresses. Fabric & Structure: It is very well make I should say. the lace is very strong. It is not the lace you find in a gift shop (gift box lace). It is proper waist trainer lace. looks like shoe-lace. Fabric is very strong mesh which is very easy to breath I guess. Wearability: It is very short which just fit around your waist. I have never had a short waist cincher like this. All my other waist trainers are too long for my waist. I really like this one I got myself 2 exactly the same one. Lace is quite long, I had to cut some and use lighter to make a closure on the end and use tape to make a nice end just look like a real one. It ends up well, and it is easier to hide inside of the cross back after I tailored it myself. I guess it does need the extra bit because after I tailor it, every time when I try to put it on, I ran out of lace to be able to put straight from the holes of the last 2 holes close to the end…. so cut long story short, don’t tailor it if you can…. just wrap around your waist and tie the nod from the front while you do the training. It would be more benefit than if your tailor job end of like mine. Effectiveness: I wish I started this regular training earlier. Because I want to measure the effectiveness of each trainer, I use each above trainer 1 day at a time and measure myself every morning before breakfast (after toilet). Group B inner body training is one of the most effective training. This waist trainer is my queen. It shape very well too. You need to pick the shape when you buy waist trainers (waist cinchers). This is by far from what I have out of nearly a hundred waist trainers, the best one I have ever have. I am not exaggerating and I am not getting paid over my article. You can see I don’t write very well at all. I only just got a pass over my high school English Form 6 and that was the highest education over my English level. LOL. Nowadays it is a good thing everyone (anyone) can write whatever they want to say and put it up somewhere for people to read.